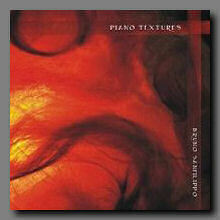 "Piano Textures" is only $15.00CAN plus shipping and taxes where applicable! would you like to be notified when it becomes available again? mail us. Bruno Sanfilippo "Piano Textures"
"Piano Textures", the latest from Bruno Sanfilippo, is a wonderful example of the less is more school of recording, a stunning disc that revels in creating a series of environments using only minimal instrumentation. Largely based around live work using a grand piano with some processing and sparse accompaniment, Sanfilippo has crafted a powerfully emotive and beautiful disc. Featuring minimal piano-based loops and patterns, Sanfilippo masterfully creates mournful melodies that are delightfully dark and haunting. Tracks range from sparse tracks where piano is the only instrument, to more complex works where metallic pads and a smattering of strings add to the environment, filling out the sound but never detracting or overpowering the delicate beauty of the piano found throughout all of the disc's songs. It's a disc of rich sounds and subtle nuance, where Sanfilippo is able to alternate between deep atmospheric pieces like "Piano Textures V" where tones are effected and processed to create a spacey almost drone-styled environment, to the simple charms of "Piano Textures VII" where the piano is played organically and naturally. Taken as individual pieces, Sanfilippo shows himself to be equally comfortable in a variety of styles, and taken as a whole, "Piano Textures" proves him to be a bright new star in the ambient scene. Dreamlike and emotive, by turns both very beautiful and very sad, "Piano Textures" is a wonderful disc that showcases Sanfilippo's talents and skills. A truly wonderful work to become acquainted with this very talented performer.